Thanks to all of you who participated in our recent survey. We wanted to know what issues you were most interested in working on. More than 10,000 of you responded. And the results are now in. 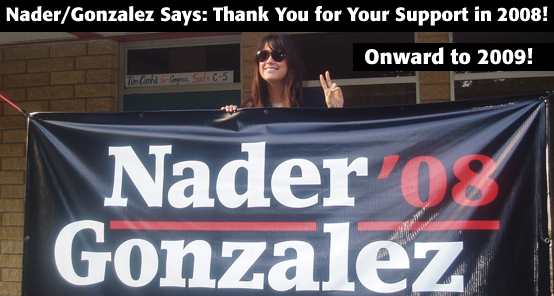 Nader/Gonzalez on in 45 States! Thank you for subscribing to receive e-mail updates. Yahoo!, AT&T, and Bell South subscribers, please click here to ensure you receive our mailings.